The mouse-over platform provides a number of high-end features. Ideal for universal use, the ambidextrous mouse-over platform has a quick-connect feature plus tilt and swivel adjustment. 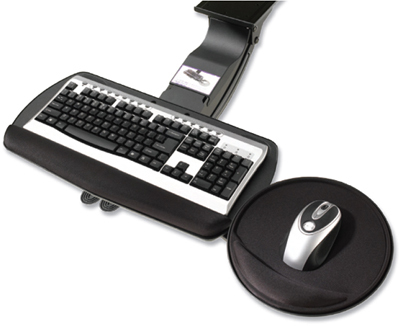 For added comfort, the smooth contoured keyboard platform includes a gel palm support. Switch your mouse from right to left without any tools! Non-skid surface pads keep keyboard stationary. All mechanisms provide at least -15˚/+10˚ tilt and are available in two track lengths. Features low profile design in a lever free mechanism. The revolutionary dual paddle AKP85 mechanism with extended reach. The revolutionary dual paddle AKP75 mechanism for all work stations. The single paddle keyboard mechanism that offers rock solid performance.